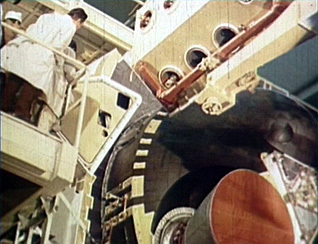 In the case of an average engines assure, in first, an accelerated combustion of the fuel after the separation of Energia (until kg/s 70) to re-stabilize the shuttle. 2 orbital operations engines (main engines) with a thrust of 90 kN and a specific impulse of 362 s, it can be switched on until 5000 times during a flight. 38 control engines with a thrust of 4 kN and a specific impulse of 275-295 s (according to the destination), they can be switched on until 2000 times during a flight. 8 engines of precise orientation with a thrust of 200 N and a specific impulse 265 s, they can be switched on until 5000 times during a flight. 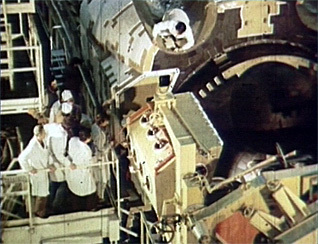 The filing up of all the oxygen for the engines in a cryogenic low pressure tank (the use of a tank cooled at -210 °C allowed to avoid the losses of oxygen by evaporation and avoided the use of refrigerated truck). The supply of gas turbines by oxygen mixed with a small quantity of fuel. 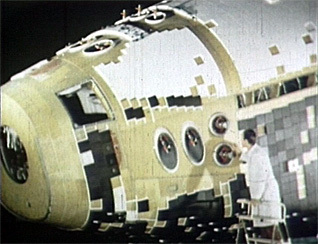 The storage of liquid combustible in conditions close to the weightlessness, thanks to a structure in honeycomb in the lower part of the tank. The implementation of an electrical ignition system, the cooling by oxygen gas and the control of the quantity of oxygen in the combustion chamber to limit the soot-forming. The increase of the propulsion capacity of the main engine (90 kN) which allows to use it for the speeded-up combustion of the fuel in case of damage, but also with the aim of increasing the total efficiency of the system. The autonomous thermal control of the motor unit notably by the traffic of cold fuel over the warm elements. 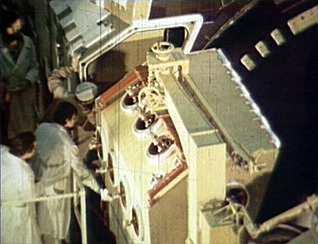 The use of long life engines. 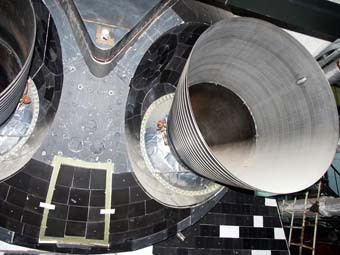 The connection between the motor unit and the launch pad. 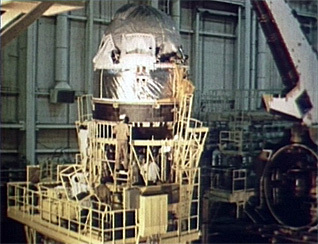 The main engines and the orbital precision steering system were elaborated in НИИ Машиностроения in the area of Sverdlovsk. 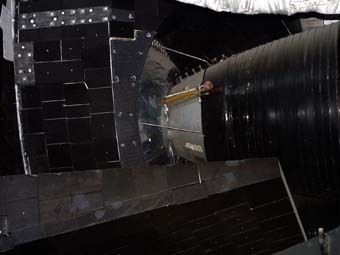 The main engine or the orbital operation engine is used for the corrections of orbits, the interorbitals passing and the slowing down of the shuttle for its descent in the atmosphere. 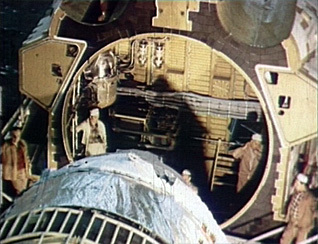 The main engine ЖРД is constituted by a system of fuel pump activated by the gas turbine working in space and in weightlessness. 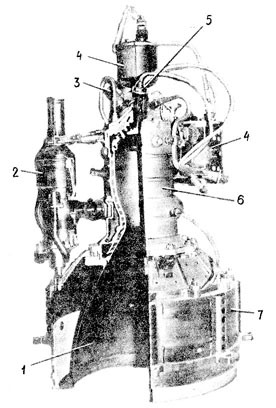 1-Heat exchanger of the nozzle; 2-Regenerative of the top nozzle; 3-Turbo-pump; 4-Entrance gas pipe; 5-Combustion chamber; 6-Mount; 7-Rudder actuator; 8-Gas turbine; 9-Protective shield; 10-Plug of the drainage pipe. The engine works with a high combustion output (the specific impulse is 362 s). The pressure in the combustion chamber is 7.85 MPa, the warm elements are assembled without welds and the gas turbine can support until 4600 °C. The position of the nozzle with regard to the nominal plan is tilted by 6 °. 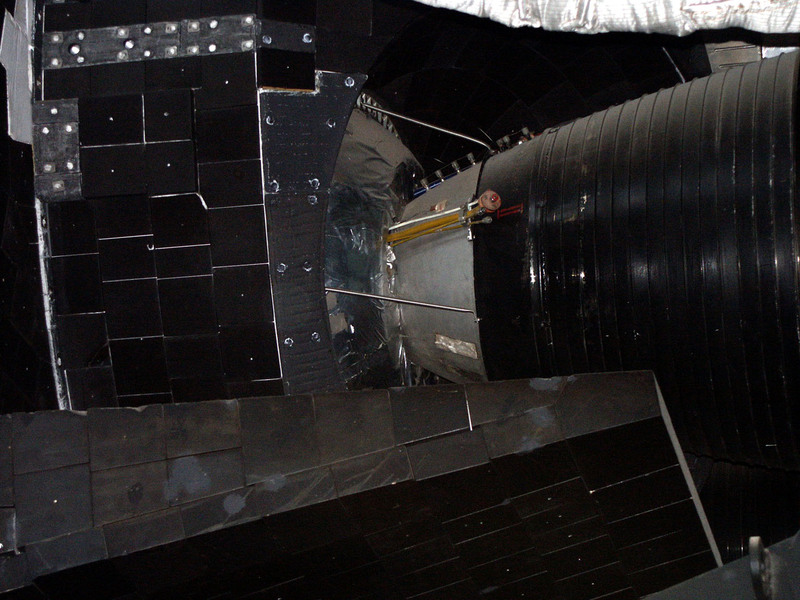 Pictures from the test model stored at the technique of the spatial machines museum. 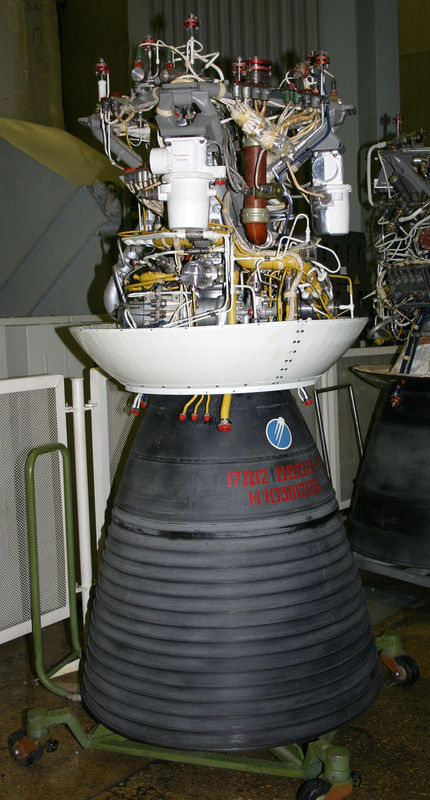 The engines work with vaporized oxygen and fuel, they work by impulses of 0.06 to 1200 s. They are used for the orbital flight and the descent until 10 km height. 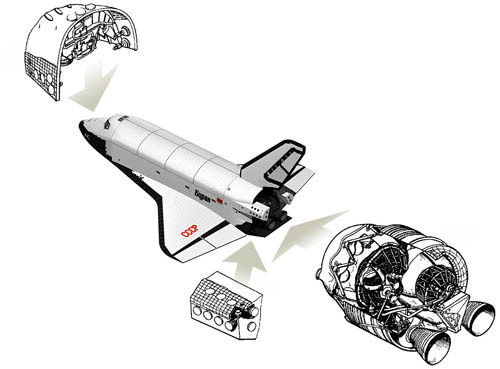 The longitudinal engines which double the main engines in case of damage possess a bigger specific impulse. For the inflammation of the fuel we use a electrical ignition system by induction. 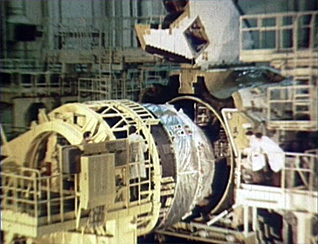 The combustion chamber and the nozzle are cooled by the traffic of the oxidizing gas and the air valves and the spark plug by radiation. 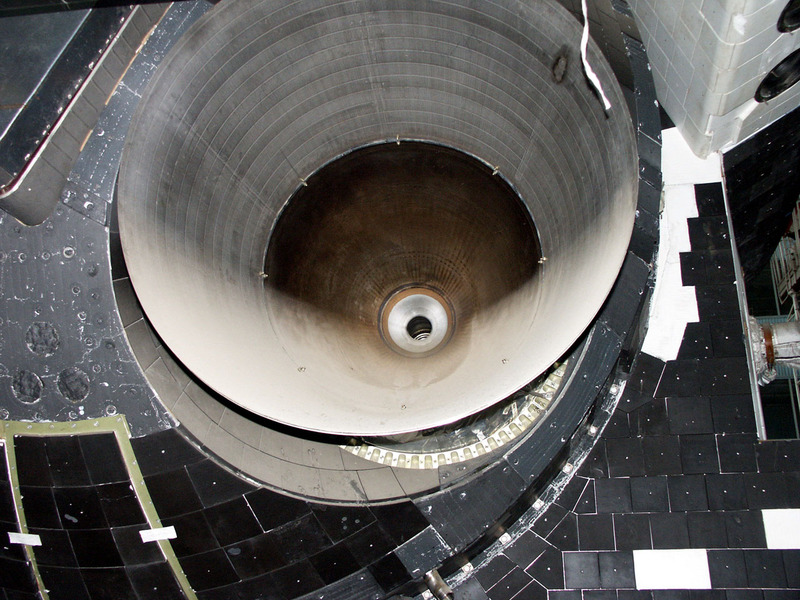 Engines reach 90 % of the thrust in 0.06, the functioning frequency is 8Hz. 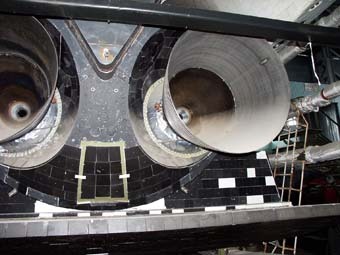 The minimal specific impulse is 180 s. These engines can bear 26 000 ignitions. To limit the soot-forming the constituents ratio of fuel is increased (3.5-4) with the superfluous oxygen. The main mode of functioning of these engines are impulses from 0.06 to 0.12 s with specific impulses of 227 to 237 s.
1-Tailpipe; 2-Oxidizer valve; 3-Fuel valve; 4-Ignition machines; 5-Pressure sensor; 6-Combustion chamber; 7-Cooler. 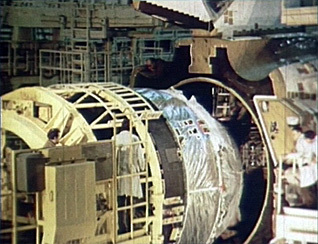 Assembling of the Buran's engines in 1987.